This is a MSX 2+ computer. No great enhancements over the MSX 2, the MSX 2+ has 19268 colors instead of 512, some more graphic / KANJI resolutions and the FM-PAC cartridge is included, providing 9 channels of FM sound without drums or 6 channels FM sound with 5 FM drums. 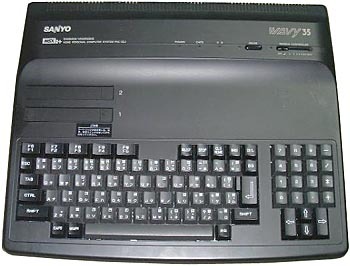 However, the Sanyo Wavy 35 lacked the Sound cartridge but featured the Rensha Turbo, which was a built-in auto-fire system. The repetition speed could be adjusted with a slider. There was also a MUTE button, which apparently muted all sounds (?). KEYBOARD Full-stroke keyboard with numeric keypad, 5 function keys and arrow keys. see more Sanyo Wavy 35 Ebay auctions !